Which brand can tackle the toughest stains? We put laundry powders and liquids to work on 10 common stains including grass, blood, baby food and chocolate ice cream. You can refine the product list to view results for either front- or top-loading washing machines. Bottom line: When tested in a TOP LOADER, this detergent performed only just OK overall and was poor at removing everyday grime. Bottom line: When tested in a FRONT LOADER, this detergent performed OK overall and was just OK at removing everyday grime. Bottom line: When tested in a TOP LOADER, this detergent performed only just OK overall and was just OK at removing everyday grime. Bottom line: When tested in a TOP LOADER, this detergent performed poorly overall and was poor at removing everyday grime. We wash specially stained fabric swatches in our lab. We add bath towels to approximate a typical load of washing. These swatches are used by detergent companies and consumer organisations worldwide. One swatch is stained with nut oil, milk and a colour pigment. This swatch is used to measure performance on “everyday grime”. The other swatches test a detergent’s cleaning ability on nine common stains: collar and cuff grime; grass/mud; olive oil; tomato; make-up; chocolate ice cream; baby food; motor oil; and blood. We measured the recommended amount of detergent for a normally soiled load and used this to wash test loads at 20⁰C, the most common wash temperature. Each load contained two swatches of each stain and each detergent is tested twice. Products suitable for both top- and front-loaders are treated as two separate products and are tested in each type of machine. We tested detergents on “normal” wash cycles, which is what a consumer is most likely to choose for an everyday load. After washing, we measured how much of the stain was removed from each swatch using a spectrophotometer. We test using pre-stained fabric swatches – the stains need to be particularly tough to show up differences in detergent performance. So the scores shown are an indication of each detergent’s relative wash performance, not a measure of the amount of soil removed from the fabric. At home, you can expect detergents to remove more of each stain, especially if you get to them quickly. Most manufacturers produce a detergent suitable for both front- and top-loading washing machines, but our testing shows stain removal results won’t necessarily be the same in both types of machine. This is mainly due to differences in the wash cycles. Top-loaders clean your clothes in less time by vigorously swirling them back and forth in a large amount of water while front-loaders do the job slowly and more thoroughly, by turning your clothes over gently in a smaller amount of water. Top-loading machines generally don’t perform as well as front-loaders when it comes to stain removal. For this reason, we set a lower benchmark for recommending top-loader laundry detergents than for front-loader laundry detergents. We include a wash using only water as part of our laundry detergent tests. In our front-loader test it earned an overall score of 51%, only 2 points below the lowest-scoring product. In our top-loader test, water achieved an overall score of 44% — which was 3 points behind the lowest-scoring product. In previous tests, we’ve tested some detergents using warm water (40°C) to check whether there’s any difference in performance. Overall, we saw a small improvement in dirt removal when using warm water, but it depends on the type of stain you’re trying to remove. Some detergents perform better in cold water than warm with some stains. For example, blood stains tend to set in warmer water so you’re better off tackling these with a cold wash.
Surfactants lower the surface tension of water. This lets the water penetrate cloth more easily and so it helps remove oil and grease. Specialist front-loader detergents sometimes contain silicon compounds or special surfactants to reduce the amount of foam. Enzymes target stains such as milk, grass and blood. Enzymes can cause irritation – so avoid them if you have sensitive skin. Optical brighteners are supposed to make clothes look whiter and brighter. They help minimise greying of white fabrics but they don’t actually remove dirt. People with sensitive skin should avoid detergents with brighteners. Builders help surfactants work better by softening hard water and raising alkalinity. They hold dirt in suspension so that it’s flushed away with the water and not re-deposited on your clothes. Fillers stop washing powders clumping in the pack (so it makes them easy to pour). Fragrance is for cosmetic reasons and to mask the smell of the ingredients. Phosphates have been disappearing from laundry detergents. All products in our test were low-phosphate or phosphate-free. There’s nothing more annoying than finding white marks on freshly washed clothes. This is usually caused by detergents not completely dissolving in the wash. We measured the amount of solids left in the water after a wash. This indicates which detergents are more likely to leave those pesky marks. We scored the detergents on a scale of low, moderate and high. The best combination for avoiding white marks is a front-loader washing machine using liquid detergent. While this test shows how likely a detergent is to leave solids behind, your washing machine and its current condition can also be a factor. Any detergent solid build-up in your washing machine could leave white marks on your clothes. We recommend regularly cleaning your machine using a hot wash. Unfortunately, there’s no environmentally friendly detergent. All place a burden on the environment, in the materials they release into our wastewater and in their manufacture and packaging. Some have less impact than others because they recommend lower doses and leave out ingredients that don’t contribute to washing performance or may harm the environment. Ingredients commonly targeted are phosphates, enzymes, and optical brighteners. Some laundry detergents claim to be more environmentally friendly than others. Manufacturers can back their claims by applying for accreditation to an environmental labelling scheme. 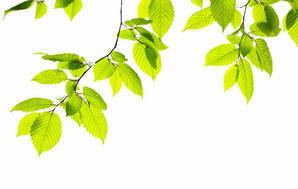 Environmental Choice is endorsed by the government and run by the independent New Zealand Ecolabelling Trust. It’s a member of an international eco-labelling network. To meet the standards for a laundry detergent, a manufacturer must provide test reports and evidence that its product doesn’t contain ingredients that are harmful to the environment or unnecessary for removing dirt. As well, the test evidence must show that ingredients are readily biodegradable. Environmental Choice allows phosphates but limits the amount that can be used; and it places a limit on the pH of the detergent. Products approved by Environmental Choice must also meet criteria for consumer information, packaging and cleaning performance. 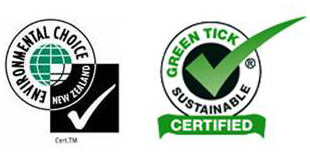 Green Tick is a New Zealand company that audits manufacturers’ processes against independent standards for sustainability and quality management. To achieve accreditation, the manufacturer is assessed by an independent auditor who reviews documentation, inspects the factory, and checks with government agencies that there are no health and safety or environmental issues. Some products in the manufacturer’s range are also randomly selected for assessment. Here’s how you can reduce the impact of washing on the environment. Use the lowest acceptable wash temperature to save energy. Do full wash loads. Some washing machines use the same amount of electricity and water, whether they’re full or half empty. If you’re faced with a challenging wash, try these tips. Increasing the dose above the recommended level will get really dirty clothes cleaner but it won’t make much difference in a normal load. There’s a point at which adding more detergent produces no improvement: you’re simply discharging more chemicals into the environment and wasting your money. A warmer wash could help when something’s really grubby … but check the garment’s care label first. Higher temperatures soften dirt and oily stains, making it easier for the mechanical action of the washing machine to remove them. But cold washes are just fine for regular washing and they save on power bills. 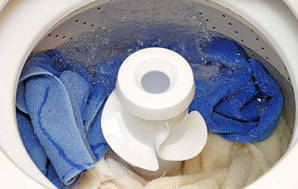 You can improve the results of a normal wash by pre-soaking clothes. This helps loosen dirt so it can be removed more easily. Rubbing a little detergent into especially soiled spots will also help. Again, check the care label first. To keep your whites really white look for a detergent which contains optical brighteners. They give fabrics a cleaner brighter appearance by coating them in a reflective solution. Wash your whites separately, because dye can transfer between clothes during the wash. 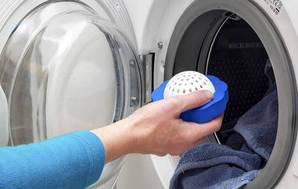 Washing with laundry balls and soap nuts isn’t new but these detergent-free methods continue to have a loyal following. We put 4 laundry balls and soap nuts to the test against 10 common stains. 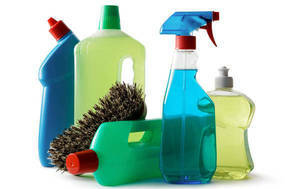 You can reduce the impact of chemicals by using only rinse water. 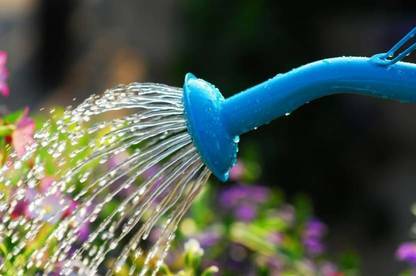 If your garden is suffering during a dry spell you might be tempted to use water from your washing machine. But there are health issues in collecting and recycling grey water (that’s the wastewater from the sink, bath, shower and washing machine but not from the toilet or bidet). If you’re diverting the grey water to a tank you should ask your local council whether you need a consent. You won’t need one if you’re simply collecting the water in containers to water the garden straightaway. Salinity/sodium (the sodium in salts harms plants and affects soil structure). Phosphorus (when this gets into waterways it can cause excessive algal growth). High pH (laundry detergents that have a high pH can harm plants). Almost all the detergents in our test claim be phosphate free or contain only low levels of phosphates. Don’t use any type of recycled grey water – wash or rinse – on acid-loving plants such as azaleas, rhododendrons, daphnes or camellias. And don’t use grey water on anything you may eat raw.